Israeli judoka Ori Sasson, second from left, arriving at Ben Gurion Airport near Tel Aviv, Aug. 15, 2016. 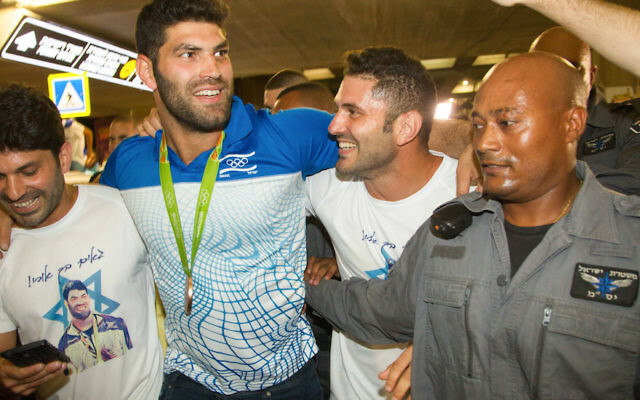 JTA — Hundreds of fans showed up at Ben Gurion Airport to welcome home Israel’s Olympic medal-winning judokas. Entering the arrivals hall at the airport near Tel Aviv Monday night, Yarden Gerbi and Ori Sasson were showered with flowers. Supporters waved flags, sang patriotic songs, and held up pictures and posters of the athletes. “I didn’t expect so much craziness,” Gerbi said, according to the Israeli news site Ynet, which reported that nearly 1,000 people packed the airport. Gerbi and Sasson both won bronze medals in judo at the Rio Olympics. The medals — which bring Israel’s all-time total to nine, five of them in judo — were a bright spot among disappointing performances and controversy for Israel in Rio. 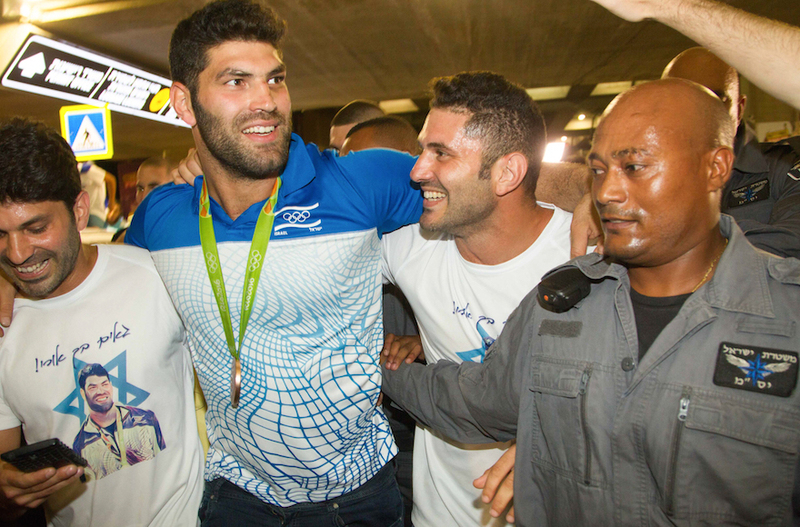 Gerbi and Sasson have become instant national heroes and helped establish judo as Israel’s unofficial national sport. They were celebrated last week with headlines in the Israeli press and congratulatory phone calls from Prime Minister Benjamin Netanyahu. After beating Egypt’s Islam El Shehaby, who refused to shake his hand afterward, Sasson won two more matches before narrowly losing to undefeated French legend Teddy Riner. He then prevailed over Alex Mendoza of Cuba to earn the bronze in the men’s over 100-kilogram category. Gerbi defeated Miku Tashiru of Japan in the women’s under 63-kilogram category on Aug. 9 to claim her place on the Olympic podium.